Why should mortgage lenders be recapitalising the banking sector? It is time to refocus and redirect the public’s anger at the banking sector whose malpractices were integral to the crisis from which we are still reeling. Thus far the public discourse has concentrated on the bonus and risk culture that developed in investment banking in particular before the crash. But covert recapitalisation strategies arguably being used by the banking sector to recoup the private (but not the public) losses arising from such malpractices have gone unnoticed. Chief amongst these has been the opening up and further widening of a substantial and unprecedented interest rate spread between the Base Rate on the one hand (the cost of national borrowing) and the rates of interest charged by banks on commercial and consumer lending (including mortgage lending rates) on the other. The irony is that whilst citizens and consumers have suffered only indirectly from the bonus culture of the banking sector, which has been politicised so effectively in media coverage of the crisis, they have suffered far more directly from the largely undetected recapitalisation practices of the banks from which they borrow. Arguably, between a third and a half of the cost of a standard variable-rate mortgage today takes the form of a covert bank recapitalisation charge arising from an interest rate spread that was not there before the crisis and for which there is no justification. The point is a simple one. The Base Rate, as we know, remains at a historically unprecedented 0.5 per cent. So the cost of borrowing is historically low ‑ right? Well, conventionally, and until recently that would have been the correct inference to draw. But that was then and this is now; the Base Rate is not quite what it once was. Indeed, it’s not quite what it was even very recently. As was widely noted at the time, as the crisis unfolded the LIBOR spread (essentially, the difference between the inter-bank lending rate and the Base Rate) grew significantly. But it has since closed up again. What is rather less commented upon is that the equivalent mortgage and commercial lending rate spreads which also widened considerably during the crisis have yet to narrow, as even the outgoing Governor of the Bank of England conceded in 2011. 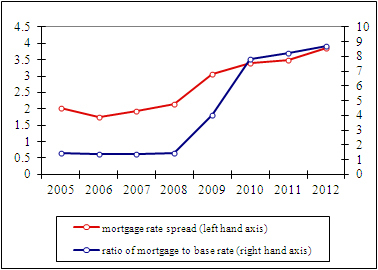 This is clearly demonstrated, for mortgage lending in the right hand figure ‑ which shows both the mortgage spread and the ratio of average mortgage lending rates to the Base Rate since 2005. Similar graphs could be drawn for commercial lending and other forms of consumer debt. What it reveals is a step-level increase in the cost of borrowing in Britain that we can no longer afford to ignore – and with major macroeconomic implications. A first time-buyer seeking, say, an 80 to 90 per cent mortgage will typically be offered a fixed interest lending rate of around 6 per cent – an historically unprecedented multiple of 12 times the Base Rate. The growth in the mortgage rate spread that the graph indicates is a tacit form of bank recapitalisation – and it is also a significant drain on consumer demand and hence growth. In practice, then, the effective Base Rate is far higher than 0.5 per cent ‑ and, as is now clear, even at this rather higher effective level inflation remains unchecked. What’s more, with such large mortgage and commercial lending rate spreads, the Base Rate becomes a less effective instrument of monetary policy, since the relationship between the Base Rate and actual lending rates is more mediated than before. Whilst the banking sector recapitalises, the government and the Bank of England appear to have turned a blind eye to this; but it is arguably a much more significant issue than the scale of investment bank bonuses which have attracted far more political scrutiny. That said, this is an argument for politicising the cost of commercial and consumer borrowing, not for depoliticising bank bonuses – the two are intimately connected. Part of that politicisation process might well involve shaming the banks (certainly those in receipt of public funds) into acknowledging their public duty not to provide bonuses to their investment bankers until such time as they have no need to recapitalise their investment arms through cross-subsidies arising from commercial and consumer lending. Overall mortgage and commercial lending spreads have yet to close up in the way inter-bank lending rates did. It has become more costly to borrow at a given base rate; or, in other words, the monetary authorities have allowed the banks to pass on a significant part of the cost of their recapitalisation to borrowers – suppressing both consumer demand and investment in the process. For so long as commercial and mortgage lending rates remain punitive, consumption and investment are being crowded out by bank recapitalisation – making both the partial resuscitation of the old growth model and, indeed, the transition to a new one less likely. This is a serious impediment to growth – all the more if that growth is itself dependent on consumer credit. As this suggests, if the economy is to be ‘rebalanced’, then the government and the Bank of England need to be putting concerted downward pressure on the actual cost of borrowing (independent of the Base Rate), particularly in sectors where a clear link to the growth strategy for the economy can be made and substantiated. The banks have been allowed to recapitalise themselves by charging commercial borrowers, mortgage holders and those servicing consumer debt a sizeable interest-rate premium, relative to the Base Rate to compensate them from their investment banking losses during the crisis. This is both intolerable and a significant drain on the growth prospects of the commercial and consumer economy. The banks need to be held publicly to account for their behaviour. Yet this is not the only implication of the above analysis. For as long as the Base Rate remains no guide to the actual cost of private lending, there is a strong argument to be made for not just private but public investment in support of a clearly articulated growth strategy built on identifying and supporting growth in a series of key export-oriented sectors. That’s because the cost of financing long-term public borrowing is significantly lower than for commercial lenders. Public infrastructure projects are also likely to be key to any reconfiguration of the economy which might more closely align its structure to a new (and more clearly export-oriented) growth strategy. Public investment might be a highly cost-effective way of providing the public goods on which the transition to a new model of growth relies. The above argument is presented and defended in more detail in the first of a series of SPERI Papers published on 9 January 2013.